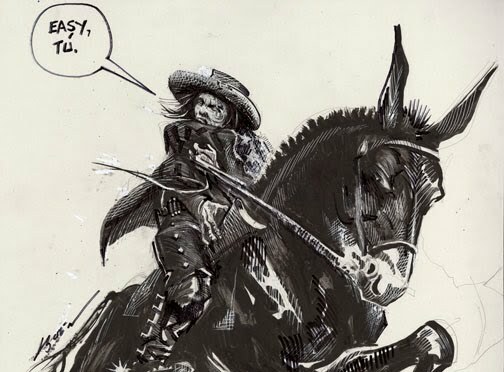 Yes, the Mickster (seen here reaching for his Sharps rifle) rode a mammoth Jack, 16-hands-high. He is a handful, to say the least. Mick calls him Tu, which is Spanish for "you." "I have struggled with every angle of the composition and while I have some beautiful passages, the painting as a whole does not possess a moving quality. Some days of the last month I worked on after dark, in the studio, with electric light always on this same picture of the Rio Grande Canon then I would eat my supper at 10:30 at night. And one day I was so interested, or struggling so hard, that I did not eat any lunch, but continued to paint until dark.—These are all intimate details of how foolish a painter can be, even at sixty years of age. If I get a good picture as the result of my efforts, I am happy. But sometimes even after several months' work I have to give it up, and burn the canvas or destroy it."